What’s up Tampa!? Lisa here, with a report on our favorite Arts and Culture in Tampa Bay. Going on right now at the Straz Center is the musical Wonderland. I had the pleasure of attending on opening night, and I just wanted to tell you all about my experience. Before I get into the details I thought it would be a good idea to give you a little background on Wonderland (though you would have to be living under a rock not to have at least heard something about this musical)! 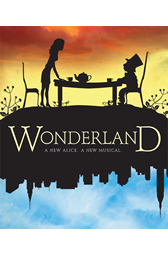 Wonderland is the first musical to be produced in the Broadway Genesis Project. This is an initiative by the Straz Center to encourage new work that might tour or go to Broadway. Originally, Wonderland opened last December and then was transferred to Texas in January where it got a little makeover. While in Texas, Wonderland became the highest grossing musical to ever be at the Alley Theater in Huston. Wonderland is now back in its hometown from now until the 16th. It will then debut on Broadway April 17th! I am a theater fan, and I think that’s so cool (ok some may say I’m a theater nerd, but that’s ok I’m proud of it)! I’m not going to give away any sort of plot details, if you want those you can head to this website. I personally like not knowing much because then I don’t have any pre-conceived ideas about what I think should happen. What I am going to tell you is why I liked this musical so much. By no means am I any kind of expert however, I have seen quite a few musicals in my day. Everything from 42nd Street, to The Lion King, to Les Misérables, to Wicked, to Legally Blonde; I mean the list goes on and on. To me Wonderland has it all; great talent, amazing set design, good storyline, perfect costumes, and humor, lots of humor. I was actually crying I laughed so hard. They interact with the audience while maintaining character, again the set is so cool, and the right feeling is there (if you see a lot of musicals you get what I mean about feeling). It reminded me a bit of Wicked (of course in a good way), and I LOVED the humor. I would recommend this musical to anyone. I saw people from as young as 7 to as old as 98 (ok I’m not sure how old, but you get the idea). It is very family friendly, and it’s in the smaller theater so even my seat in the very last row (not exaggerating) was perfect. So get out there Tampa, and show your support for the arts and for an amazing program the Straz Center has created. Hat’s off guys, I think you have a winner! That’s all for now, but keep checking back for more Things To Do In Tampa Bay, and other awesome Tampa Bay Area Events.